Bluff Lodge – 120 Gore St, Bluff, 03 212 7106; 027 294 5306. A range of accommodation, including dorm rooms. Bluff Camping Ground – 21 Gregory St, Bluff, 027 626 2018. This is between the main centre and Stirling Point. Lands End B&B – 10 Ward Parade, Stirling Point, Bluff, 03 212 7575. First off, consider whether you need to stay overnight in Bluff. Bluff looks like it could be a very nice place to stay, but an alternative, which will save you carrying all your gear, is to stay overnight in Invercargill the night before, leave most of the contents of your pack there, and catch a shuttle to Bluff early in the morning with only what you need for a day walk. The shuttle will take you right to the start point, Stirling Point, where there is the famous signpost pointing to distant cities all over the world. Remember to get your photograph taken here! At the start it is a nice walk around the south side of Bluff Hill followed by farmland. Then it is a long, dangerous and unpleasant 16k walk along a busy road. On the scale of best and worst bits of the TA, this ranks strongly at the worst end, but at least you get it over with on day one. An alternative at low tide is to walk along the beach at first, to opposite Colyers Island, though the distance is a little greater than the road. When you reach Colyers Island you can continue along Princes Rd, which runs parallel to the main road, and when it runs out, struggle through scrub and long grass via an underpass to the Old Bluff Highway on the other side, and then up to the main road when it later turns in to Heenans Rd and veers west. You save about 8k in total of main road walking this way. Another tempting option to minimise road walking is along the railway line. But this is also dangerous, as well as unlawful, and it is not necessarily easy walking on the stones that build up the line. Which option is safer? How often do trains run? Probably according to freight demand. Certainly do NOT wear earphones on the rail line – you will need to listen for trains coming from behind. And if a train driver spots you I expect they will report you immediately. An encounter with the police on your first day is probably not the best way to start. At the fertiliser works a road (Kekeno Pl) to the left crosses the rail line. Just a few metres west of the railway is the beginning of a cycleway to Invercargill. Now the walking is much more pleasant, though there is little shelter or shade on the route, and no drinking water sources or toilets. Invercargill has two major supermarkets close to each other, Pak n’ Save at 95 Tay St, and New World at 244 Elles Rd (as well as Countdown at 172 Tay St). Plus there are Kathmandu (50 Leven St) and Macpac (48 Tay St) stores for hiking supplies, including gas. Tuatara Lodge – 30-32 Dee St, close to the centre of town – 0800 488 282; 03 214 0954. Southern Comfort Backpackers (BBH) – 30 Thomson St, 03 218 3838. Includes female-only dorm. North of the centre and abut 1km from the nearest large supermaket. Central City Camping Park – 209 Tweed St, 03 214 2226. Remarkably central and with free wifi and cabins. Catch-a-Bus South – 03 479 9960. They go from Invercargill to Bluff at 6.30 and 10am on weekdays and 8.30 am on weekends. Pickup is from your accommodation. 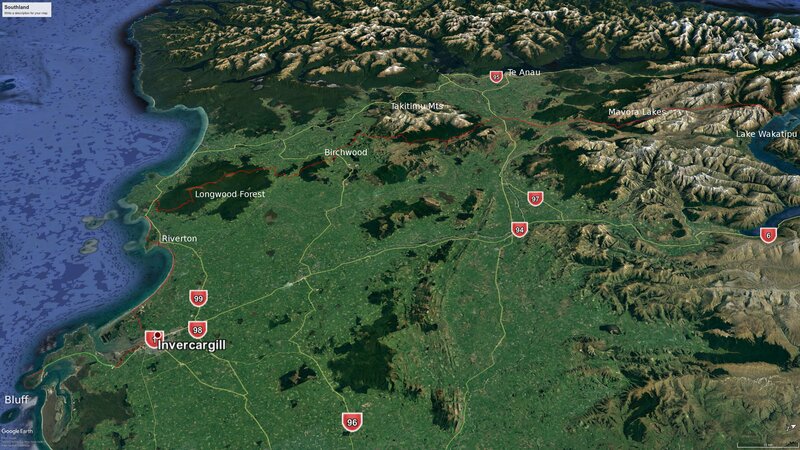 They also go from Dunedin to Invercargill daily and can go on to Bluff if required. Campbelltown passenger service – 1 Lee St, Bluff, 03 212 7404. Stewart Island Experience – 03 212 7660; 0800 000 511, run a bus service to Bluff that connects with the Stewart Island Ferry. The route out to Oreiti Beach is straightforward, along a roadside, often with decent margins to give you some distance from the traffic. There are a number of reserves with toilets and cafés along the road, as well as a small Four Square store about three quarters of the way. The beach is one long, exposed slog, with no shelter. You could potentially camp amongst the sand dunes, though they are low and offer little shelter from the wind, or water. Crossing the Waimataku River half way along the beach may be a problem at high tide according to the official track notes. Riverton: The Globe Backpackers, listed in the official TA guide, appears to have been reinvented as the Monkeys Backpackers. An alternative is the Riverton Lodge Hotel, operated by a very nice couple. It is run down, but in a pleasant and comfortable way. There are several good cafés in town, a small supermarket, a museum, and a takeaway food shop. One could easily linger in Riverton. Riverton Holiday Park – 43 Richard St, Riverton, 0800 234 813; 03 234 8132. Ten or 15 minutes out of town on the way to Mores Reserve. Monkeys Backpackers – 144 Palmerston St, Riverton, 020 4120 5732. Double check it is still open: its Facebook page shut down in 2018. La Riviera Guesthouse – 136 Palmerston St, Riverton, 03 234 9100, (cheapest is $120/room). Riverton Lodge Hotel and Backpackers – 57 Princess Street, Riverton, 03 234 9945. Supervalue Supermarket – 163 Palmerston St.
Cross the bridge heading out of town, turn left around the estuary, and right up Richard St. A sign marks Mores Reserve. There is a toilet at the reserve car park. Take the Mores Track loop. It has a TA sign. Two minutes or so up is a track to the left to the lookout. It is not far and is worth visiting for the view. The track to the coast on the other side of the hill is a pleasant walk through low bush. After some time over farmland and sections of rocky coast you reach Colac Bay. The walking on this beach is less firm than Oreti Beach, making progress tiring and slow. Towards the end a road back from the beach makes a respite from struggling on the sand and stones. And once on the main road you will see a sign for the camp ground at an intersection. Head right and inland to reach the camp ground. Colac Bay: there are no shops here aside from the camp store, which sells little of use to TA walkers. But the camp ground has good amenities, including small rooms, and has a pub, with meals. The reception for the camp ground is the pub bar. Hill 106/Taiheke – Basic self-contained hut sleeping 1-2 people. One double bed and one camp stretcher. No hot water, long drop toilet. 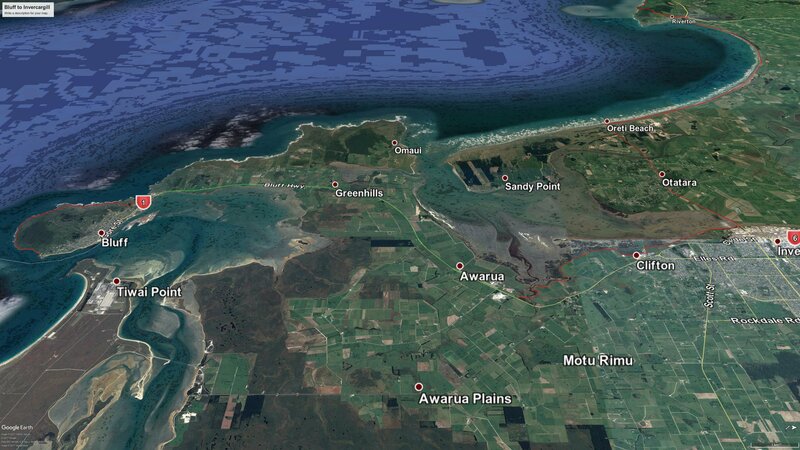 1.8km from the trail at the rocky end of Colac Bay, up the eastern end of Tihaka Beach Rd and onto Longwood Rd. $35 per person per night. Pick-up/drop-off negotiable. Kiri or Chris 03 234 9343, Kiri 021 1660112, Chris 021 1286486. Colac Bay Tavern & Camping Ground – 15 Colac Bay Rd, Colac Bay, 03 234 8399; 027 435 5872. Meals, backpacker and camping facilities available. Shangri La Crib, Colac Bay. The next two days are through the Longwood Forest. Continue inland on the road that brought you from the beach for about an 1hr to arrive at the Long Hilly Track car park. There is little traffic along the road. The car park has a toilet. The Long Hilly Track is easy to begin with, but once it ceases to be a day walker track and you begin the Ports Water Race Track off to the right it becomes much rougher, with mud and many fallen trees. The track follows a water race constructed mostly by Chinese gold miners in the 1880s and 1890s. Before Martins Hut the track meets a bush road. Turn left uphill and take the right fork when the road divides. The track off the road to the hut is clearly marked. The hut has a water tank, but if it seems dodgy, the official track notes say: “Another water source at Martins Hut is small stream off on an unmarked side track between the toilet and the hut. This is off to the left as you are facing downhill”. Martins Hut was constructed in 1905 to house a water race maintenance worker. After going uphill from Martin’s Hut you come out onto the scrub covered Longwood ridge. Marker poles along this boggy ridge are spaced well apart and would be hard to follow in low visibility. The track then descends to an abandoned quarry and joins up with a road that heads steeply uphill to the Bald Hill transmission tower. Keep on the road all the way to the top and don’t be put off by the locked gate nor deceived by a marker pole that appears to lead to a route off the road. There is water in small trickles on the right hand side of the road. There is also good cell phone reception at Bald Hill. The rest of the track continues to the Merrivale Rd end. There are several options now for a place to sleep. One is camping: there is room for about one tent here but no water source. Dense vegetation either side of the road makes camping in the area difficult in general. However, you can continue down the road until you reach another road coming in from the right. A short distance down this there are flat patches on the margins of the road that will take a tent at a pinch – just before a substantial stream that crosses the road. A much better option is to arrange accommodation at Merrivale Hut, 5km downhill at the intersection of Merrivale Rd and the main road between Otautau and Tuatapere. Or you could hitchhike to either of these settlements. 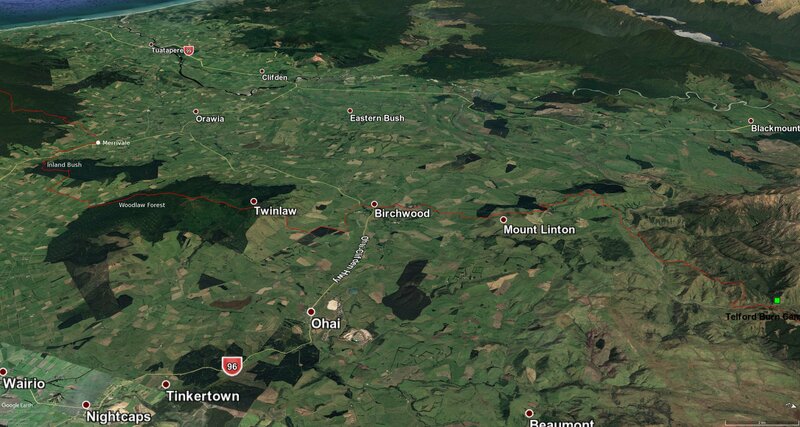 Tuatapere is about 26k to the west, Otautau 16k to the east. However, this will make for a very long day, and traffic may be very light if you reach the road during the evening. Merrivale Hut – 2 Merrivale Rd, Otautau, 021 567105. $10 or camping $8pp. Otautau Hotel – 167 Main St, Otautau, 03 225 8166; 027 410 2031. Includes rooms, bars & restaurant. Otautau Railway Hotel and Backpackers – 76-78 King St, Otautau, 03 225 8577. Backpackers, bar & restaurant. Tuatapere Motel, Shooters Backpackers & Holiday Park (BBH) – 4 McFeely Street, Tuatapere, 03 226 6250; 027 2222 612; 027 556 2655. Hump Track Backpackers aka Last Light Lodge (located within the Five Mountains Holiday Park) – 6 Clifden Rd, Tuatapere, 03 226 6418; 03 226 6667. Waiau Hotel – 47 Main St, Tuatapere, 03 226 6409; 0274 916 855. Rooms, bar & restaurant. Both towns have a small supermarket. Turn right from Merrivale Rd on to the Otautau-Tuatapere Rd. You need to look for an overbridge over a farm road. There is apparently a TA marker somewhere before this, and a stile, but if you don’t spot it just get onto this farm road and go uphill, through two farm gates to the Inland Bush track. The second gate has an orange marker on it. Further markers follow a steep track up through bush. Near the top, just as you are about to leave the bush and enter farmland again is a track to the right that is marked. This soon becomes a forest road through pine forest and the walking becomes very easy. No camping or fires are permitted in the forest. After exiting the pine forest it is less than an hour’s walk along pleasant country roads with little traffic to the well-marked turn off to another hill with a pine forest. (Or you can keep walking another 3km along the road to an accommodation option – see below). The climb up the Woodlaw Forest hill is steep, but it eventually becomes a 4WD forestry road along the top, where the walking is easy. There is one small stream in the bush on the way up. Otherwise there is no source of water for this entire day. And again, no camping or fires permitted in the forest. After passing below some cellphone towers the road meets farmland. (Note that this farm is closed to walkers from 9 September to 9 November for lambing.) Take the fence-line on the right hand side downhill. There are occasional markers, but they are very distantly spaced. Then the fence meets another at right angles, take the right hand one down an extremely steep hill. This would be almost impossible to descend safely when wet, especially without walking poles. Which side of the fence you should be walking on is unclear and maybe it doesn’t matter. You are heading for the middle of a long eucalyptus forest where the young trees meet the mature ones. The track goes alongside this plantation to the left, turns right, and reaches the Birchwood-Wairio Rd. You can arrange to get picked up here (cost about $10) if you are staying at Taylors Lodge, but if your aim is to walk every metre of the South Island TA you can first turn left along the road and walk 20-30 minutes round to the start point of the next days hike at Struan Flat Rd at Birchwood and be picked up from there. You could hitchhike the 7 km to Ohai but there is very little traffic in the evening. Taylor’s Lodge in Ohai (aka Taylors Hotel), 03 225-4510; 03 225 4244; 03 225 4041; or 021 307 505 has reasonably priced accommodation and they will hold bounce boxes. Note that accommodation is very much a sideline for the busy family, so they are not sitting around waiting for your call. To be picked up you should call several hours ahead to arrange a time – say from the cellphone towers. They also have a very limited number of rooms (maybe just one? ), so booking is essential. Family hut, 640 Scotts Gap-Feldwick Rd – between Woodlaw Forest and Island Bush, 3km west of track into Woodlaw Forest. 5 beds, drinking water, gas cooking facility, long drop toilet, no electricity, 027 7394924 (Justine), just.broughtons@gmail.com. $20pp/night. Hot shower and home-cooked meal available for extra $15pp. Pickup from track can be arranged, prior booking essential. Nightcaps is 9 km east of Ohai and has a Four Square store but apparently no accommodation. Tuatapere, 38 km south-west of Ohai, is your only other accommodation option in the region (see above for listings), unless you camp on farmland (with permission). This route is over the Mt Linton Station and access is only permitted during daylight hours and no camping is allowed. Keep to the route and give way to farm operations. There have been problems with hikers going off the marked rote. Farm management will consider this trespassing and act accordingly – don’t ruin it for others! The land is closed from 25 September to 5 November for lambing. You can take an alternative route from Dunrobin Rd (south of Mossburn & a considerable detour) to Aparima Hut at this time. There is little water for most of the route. Shortly after the start at Struan Flat Rd things get a bit confusing. There is a stile with a marker at the bottom end of a line of pine trees. One fence goes up this line, and another is at right angles to it, roughly parallel to the road. Bisect the right angle and head up the ridge between the fences. The route is well marked from the top of the ridge. It is then mostly up and down hills to the Wairaki River, where you will have to cross, but it is usually ankle height. (There is a swing bridge about 3km further up if it is too dangerous to cross, BUT this is off the trail, and you should get permission to take this route first.) After going up the Wairaki River a bit you turn into the hills and along a farm road before you rejoin the river now going west. A half km or so up you ford it at the marked spot and another km further is Telford Burn campsite. (‘Burn’ doesn’t here mean a burnt patch, but is a Scottish term for a steam, reflecting the Scottish origins of many early European settlers to the lower South Island). You will know when you have arrived because there is a round, plastic toilet bang in the middle of nowhere. There are large trees dotted about the field nearby, which offer ideal shelter for camping beneath, but the water in the small stream nearby runs through farmland, so should perhaps be treated. It’s a nice spot to camp, but fairly exposed to wind and can be boggy after rain. You could push on to Lower Wairaki Hut if you are making good time, but this next bit is tough. It is a very hard climb above Telford Burn. The markers seem to suggest you go into the bush on the way up, but ignore that. Begin on the opposite side of the fence line as the campsite and you will find markers further up: keep going straight up whether you can see the markers or not. The climb to and along the Telford ridge tops is very exposed and would not be safe in a storm. 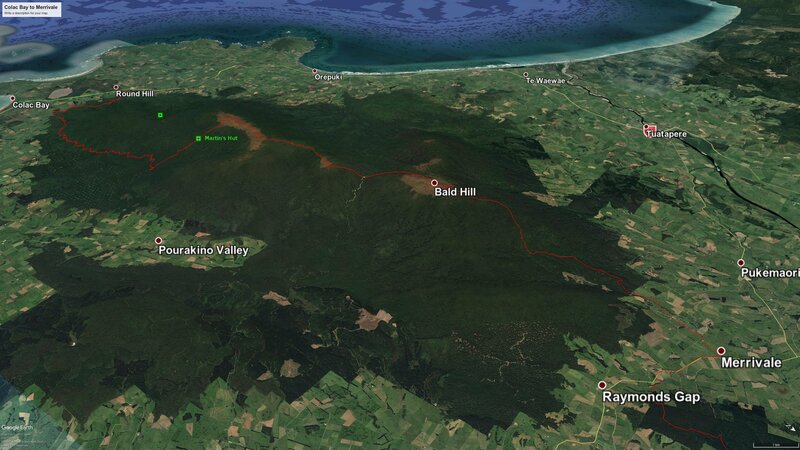 On the other hand, the descent down the other side is through the Takitimu forest and is easy going. The exit from the tops into the forest is well marked. The track is through dense tussock at times. The trail may be faint and it can be hard to see the next marker (a common issue on further sections of the TA), so you need to pay attention. Other parts are through forest. Apirama Hut is very nicely situated above a small river with a good swimming hole. There is a large flat grassed area around the hut and it gets plentiful sun. It’s worth getting there early so you can enjoy the place. There is an older, run down hut also with 6 bunks at the back of Apirama Hut. This involves further travel through a mix of forest and tussock, and once again it can be difficult to find the track. Lower Princhester Hut is not on a DoC signpost here, and neither is it at the next sign, for Spence Hut. A well hidden marker is at the bush margin near this sign at the right, marking the trail down the valley. Later, at a point where it may be hard to see any markers, the valley forks. Take the left one and markers soon appear. This is along a gravelled country road which then joins SH94. 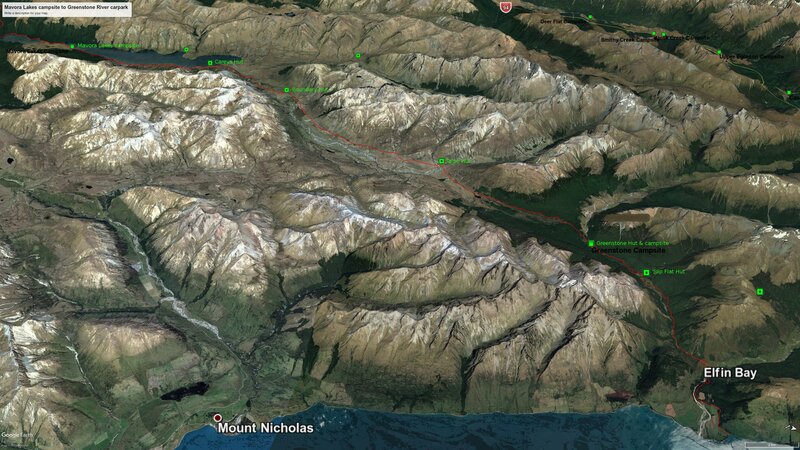 It is 20 km to the right to Mossburn and 35km to the left to Te Anau. Shuttle buses such as Tracknet travel along this road and will pick you up if you have made a prior arrangement. It is also a densely travelled tourist road, but much of the traffic is tour buses and campervans, so it can be hard to hitchhike. A stop in Te Anau is useful for resupply, plus a shower and rest, as otherwise you would be carrying food for seven days from Ohai (assuming you had a drop box there) to Queenstown. There are several outdoors stores in Te Anau, and being a tourist town, they stay open quite late. Outside Sports, on the main street (curiously, but logically named Town Centre) next to the Four Square store has all the big brands. Fiordland Frontier Supplies, off to the side of Town Centre, further away from the lake on the opposite side, is more hunting oriented, but consequently has different, and less mass-market, gear. Unfortunately, eating out is problematic in Te Anau. There are plenty of cafés and restaurants, but standards of the cafés are low (with the possible exception of Sandfly Café, on Milford Close) and the restaurants are expensive and offer limited choice. The takeaway joints of Te Anau Dairy (next to the Mobil petrol station on Town Centre) and the Habit Foods food truck opposite Countdown on Milford Close are worth considering, though have received mixed reviews. YHA Te Anau – 29 Mokonui Street, Te Anau, 03 249 7847. Te Anau Lakefront Backpackers (BBH) – 48-50 Lakefront Dr, Te Anau, 03 249 7713, 0800 200 074. Rosies Backpackers and Homestay (BBH) – Tom Plato Drive, 03 249 8431, (less central but highly rated). Te Anau Kiwi Holiday Park – 15 Luxmore Dr, Te Anau, 03 249 8538; 0800 249 555. Te Anau Lake View Kiwi Holiday Park & Motels – 77 Manapouri–Te Anau Highway, 03 249-7457; 0800 483 262. Includes BBH backpacker dorms, twin/double and single rooms. Near DoC visitor centre and is depot for Tracknet shuttles. Is further from Town Centre than the other accommodations. Te Anau Top 10 Holiday Park – 128 Te Anau Terrace, Te Anau, 0800 249 746 or 03 249 7462. DOC Te Rua-o-te-moko / Fiordland National Park Visitor Centre – Lakefront Dr, Te Anau, 03 249 7924. Intercity Coachlines – 03 365 1113, daily buses to Queenstown, Dunedin and Christchurch. Tracknet – 8088 483 262; 03 249 7777, res@tracknet.net Daily departures at 7.15 and 11.30 passing Princhester Bridge. Returning trips passing the same point at 8.50am, 12.20, 6.20pm. $20 each way. Mossburn Railway Hotel – Cnr York and Bath St, 03 248 6399. Pub style accommodation, bar and restaurant (restaurant closed Mondays). Mossburn Country Park – 333 Mossburn-Five Rivers Rd, 3 kms north of Mossburn, 03 248 6444; 021 251 9246. Backpackers, cabins, campsites. Four Square – 37 Devon St, Mossburn. The two Mavora Lakes are a popular area for camping, fishing, boating, horse riding, trail biking, and 4WD activities. You can catch a shuttle from Te Anau to the point you joined SH94 from Lower Princhester Hut, or hitchhike, then walk east along the main road to the gravel country road that turns off at left. You have two choices: turn off the road after about 11 km to follow along the Mavora River. Hikers say that this is a difficult walk through long grass and swampy patches. The alternative is to continue on the road and cut across farmland when you think you are about opposite the valley for Kiwi Burn Hut. Preferable in terms of respect for landowners, is to use one of the angler access points you see signposted now and then along the road to reach the river. Reaching Kiwi Burn Hut means fording the Mavora River whichever way you travel, and if this is high, then you need to continue about another 3 km to cross a swing bridge (there is a track to this from the road), and then turn back down river for the 3 km to reach the track to Kiwi Burn Hut (1.5 km from the river). 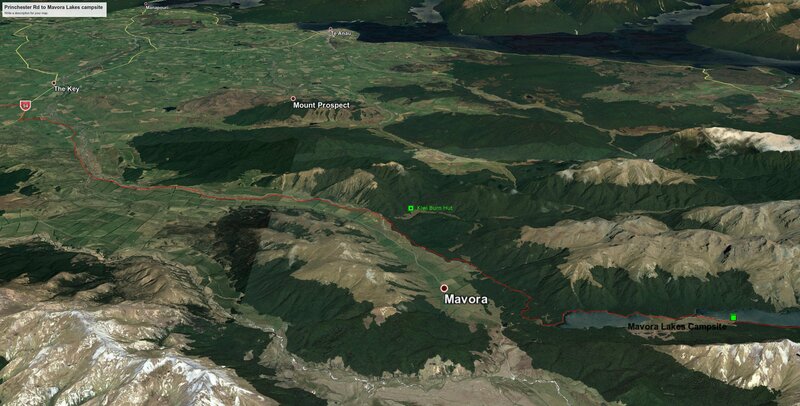 From Kiwi Burn Hut head back to near the Mavora River again and then north on the track to South Mavora Lake, where you will pass the above-mentioned swing bridge, then another at the lake (3 hrs 15). Don’t cross the swing bridge but continue north along the lakeside to the campsite at the North Mavora Lake (1.5 hrs). The campsite is mostly used by people with 4WDs or campervans and is very popular in summer. There are plenty of trees, toilets and a shelter. A fee is payable via an honesty box. The shore a little north of the camp ground is a Lord of the Rings site where the Fellowship end their Anduin River journey (grid ref 1221 / 4976; S45°15.993′, E168°10.410′). Nearby in the forest is also the area where Merry and Pippin hide from the Uruk-hai. It is then another 2 hrs 15 (6 km) to Carey’s Hut along 4WD roads on the east side of the lake. Carey’s Hut (7 bunks) is a pleasant, though run-down, hut. It has a wood burning shower but this is apparently defunct and there is little chance of finding firewood anyway. You could stop here or push on along the road Boundary Hut (1.5 hrs). The turn-off to the hut is not marked but the hut is visible on the left from the road. Leave the hut and cross the river via the swing bridge. After 3.5 hours over open country you will reach another swing bridge and Taipō Hut (8 bunks). 3 km north of the hut the track splits into two routes to Greenstone hut. Keep to the left-hand one. The right-hand track becomes poorly marked, rough, and indistinct. The Greenstone Hut is a popular hut on the Greenstone-Caples track, with a warden in summer. It may pay to get there early to make sure you have a bunk. The track to the Greenstone road end on Lake Wakatipu is easy walking through attractive bush. Many day walkers may be encountered. From the road end you can catch a shuttle to Glenorchy and then around the lake to Queenstown. The official TA position is that it is not necessary to walk the route because Queenstown is about the same latitude as the road end, and it would simply be one long road walk anyway. Shuttles may or may not be willing to pick up unbooked passengers at the road end. They tend to operate on demand – if there are no bookings then they don’t drive. And they usually need 2 people for a trip. If it is just you, then you pay for two people. You may be able to pick up a ride with one of the day walkers to Glenorchy. And from there it is a busy road to Queenstown. YHA Kinloch – 862 Kinloch Rd, Kinloch, 03 442 4900. An idyllic looking spot on the road from the Greenstone car park to Glenochy. Is some distance to Glenorchy, but you can be dropped off and picked up by the Greenstone–Glenorchy shuttle. Glenorchy Hotel & Backpackers Retreat, Information Centre and General Store – Mull St, Glenorchy, 03 442 9902. Camp Glenorchy – 34 Oban St, near info centre, cabins, bunkrooms, camping. Sustainably designed and built and ‘New Zealand’s and first net-zero energy use accommodation’. 0800-492-262; 03-409-0401. Glenorchy Motels (formerly Mt Earnslaw Motels) – 87–89 Oban St, Glenorchy, 03 442 6993. Glenorchy Journeys – Greenstone car park 10am, 12noon, 4pm to Glenorchy $35; Glenorchy to Queenstown 7.30am, 10.30, 12.45, 2.45, 4.45pm, $25. office@glenorchyjourneys.co.nz; 0800-495687; 03-409-0800. Buckley Transport – 03 442 8215; 0508 111 222; 0275 428 215, Greenstone car park to Queenstown 12 noon, $45. YHA Queenstown Lakefront – 88–90 Lake Esplanade, Queenstown, 03 442 8413. YHA Queenstown Central – 48 Shotover Street, Queenstown, 03 442 7400. Sir Cedrics Bungi Backpackers – 25 Sydney, Queenstown. 0800 728 286; 03 442 8725. Was closing in June 2017, but is still listed on hostelworld.com and other booking sites at Jan 2018. Best to check it does still exist. Maybe it has reinvented itself as Sir Cedrics Tahuna Pod Hostel at 11 Henry St, 03 442 7052. Brumbles Backpackers – Cnr Lake Esplanade & Brunswick St, 03 442 6298; 0800 286 253. There are other backpackers amongst a whole plethora of accommodation in Queenstown. There are 8 alone on the BBH website, all fairly well located (the Last Resort being the most central). Creeksyde Queenstown Holiday Park & Motels – 54 Robins Rd (about 600m from the centre of town along Gorge Rd), 0800 786 222; 03 442 9447. Fresh Choice Supermarket – 64 George St, Queenstown. Mediterranean Food Market – 53 Robins Rd, Queenstown. Alpine Four Square Supermarket – Cnr Shotover & Stanley Sts, Queenstown. Out of town (see Otago page): New World Supermarket – Hawthorne Dr, Frankton, Queenstown.